Start Selling online with Fastdot’s OpenCart Web Hosting solutions. OpenCart is a free shopping cart system that can be integrated to any hosting package Fastdot offers. Thousands of OpenCart templates, themes, extensions and modules enable you to fully customize your customer’s shopping cart experience. It utilizes a clean file system and simple interface so no technical skills are required. If you do need assistance, there is a large community online that provides plenty of support, tutorials and documentation. Fastdot Hosting also offers many tutorials and articles for OpenCart Web Hosting . OpenCart is easy to install with Installatron, our 1-Click Script Installer. The best OpenCart Web Hosting for your mission critical online store! 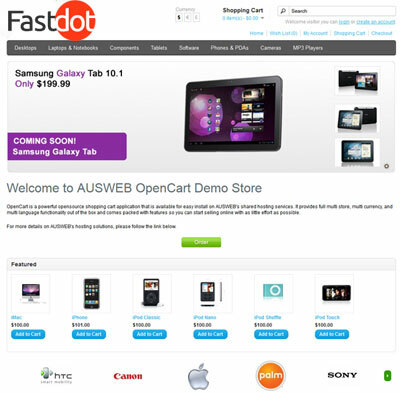 Fastdot is the preferred host of choice for your eCommerce OpenCart shopping cart. We provide free one click install of OpenCart, additional e-commerce resources, powerful clustered servers, high quality customer service and top nodge web hosting features! Fastdot provides the most stable web hosting for OpenCart along with a simple one-click installation process via Installatron. Our servers run the latest Apache, MySQL, and PHP versions to guarantee high performance and security. The one-click installation process is easy and almost instant , so you can start adding and selling your products immediately!